”God said, Let there be light: and there was light“ (Gen 1:3). The first action of God recorded in the six-day creation was to bring LIGHT into the darkened world. As such, let our first action or service be to bring God’s light into this darkened world, to save souls doomed to eternal damnation. In the Word of God, ‘darkness’ is usually compared to sin and evil, while ‘light’ stands for holiness. The first thing that God saw was LIGHT, and not anything else. ”God saw the light” (Gen 1:4). Now also, while wickedness and violence are rampant in this sin-stained world, God is anxious to see light, even His holiness, in His children. The first thing that God certified as good, was not an angel, man or woman, but LIGHT. ”God saw the light, that it was good.” If God cannot certify to your purity of life, beware, He may not accept any other goodness that might be in you. Can God testify of our personal life and say, “I saw the light in you and it was good”? The first sing that God named was not the heaven, the earth, water or darkness, but LIGHT. ”And God called the light Day.” If the Lord is to put His holy name or His ‘new name’ on us and call us ‘blessed and holy’, we must realize that TRUE BOLDNESS IS HOLINESS. Hence He has called us with a holy calling – it is a blessed calling indeed. 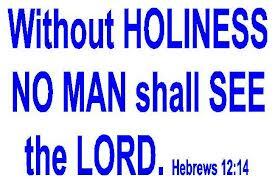 Dear reader, let holiness be the FIRST THING that God sees in you as you grow in every divine attribute. Be sure to cultivate holiness in every part of your life and ministry. Taken from Morning Manna – thoughts for Daily Devotion.